Joy Creek Photo Archive (c) all rights reserved The low compact asters reward the gardener for very little labor. 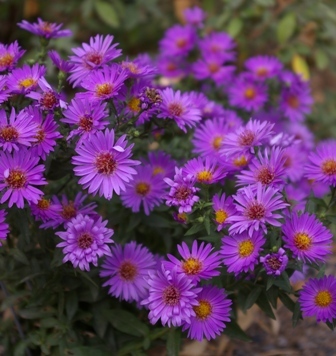 Aster 'Wood's Purple' form stands up well to heat and humidity. It will even tolerate a bit of drought. The flowers are semi-double with a bright yellow eye and show off nicely against the dark green foliage. Late summer to fall. 12-16 in. x 16 in.